It's not worth watching soccer's World Cup Final as we already know the winner. 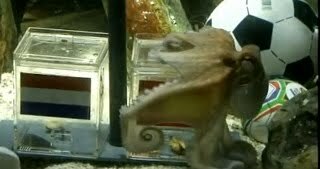 Paul the octopus has predicted that Spain will beat Holland! Don't mock Paul. He is a very talented octopus and has been right six times out of six during the tournament. Just in case you haven't heard of Paul he lives at Oberhausen Aquarium in Germany and might well be the only psychic octopus in captivity. He has a unique way to do his predictions. They are determined by two boxes being placed in his tank, each with one of the flags of the two countries involved in the game. Both boxes contain a mussel or an oyster, which just happens to be his favourite food. Whichever box he decides to eat from first will be the winner of the match. Paul headed for the Spanish box, see photo above, and gobbled up the contents. Statisticians, with nothing better to do, have been at work and reckon that the probability of guessing the correct result six times consecutively is less than 0.5 per cent, or 216 to 1. Anyway, it looks therefore like Spain will win on Sunday ... but what's this? Oh, no, a dispute! Mani, Singapore's psychic parakeet, disagrees. He's certain that Holland will be the football world champions - and his last five predictions have all been correct. 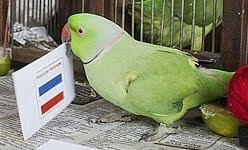 Mani does his psychic forecast by picking out an envelope with his beak - and he chose the one with the Dutch flag. So who should we put our faith in - an octopus or a parakeet? One thing is for certain, one of them will definitely be correct. Me? I'm trusting Paul. Spain, Spain, Spain. I'm with you, I trust Paul. sorry mike and suzie im with the parakeet netherlands to win.